Why does company culture matter? because it can make or break your organization and your success. When I talk about “company culture”, for me it is the same as corporate or organizational culture, so I’ll use them interchangeably. Every organization has a company culture. Even 1-person organizations. National culture talks about the values a nation, country or culture has. Organizational culture does not (!) talk about values, but rather “how things are being done here”. Which is significantly different than values. 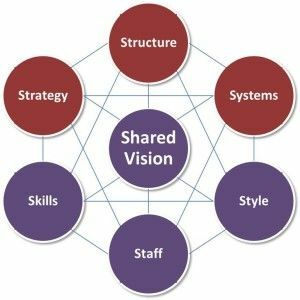 The 7S Model (pictured) clearly explains the essence of what influences a company culture; with “Shared Vision” in the middle representing the corporate culture. Contrary to National culture, company culture can be changed. How?